Protected Bike Lanes Proposed for Park View – Meeting on June 12th | Park View, D.C. 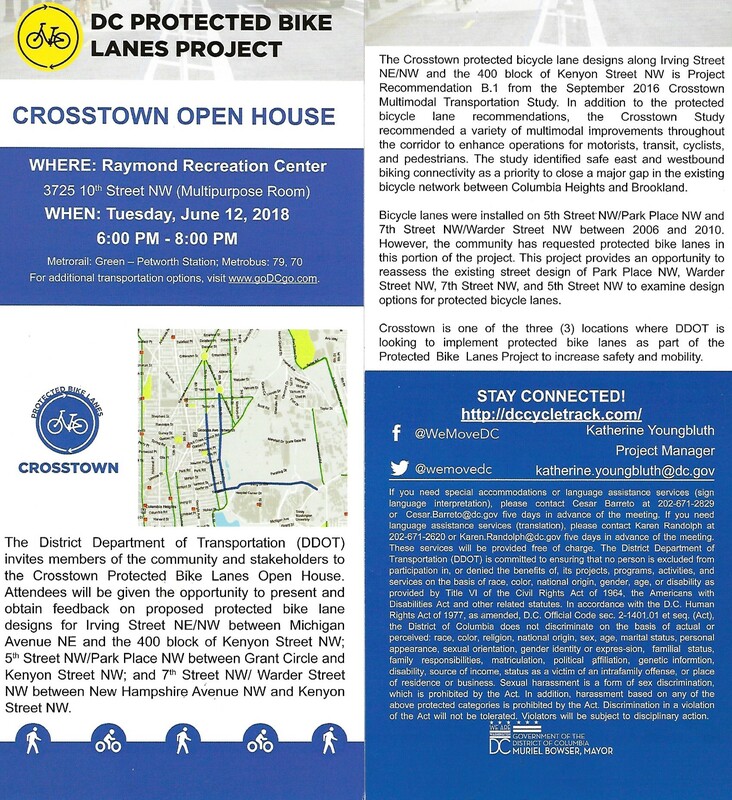 This entry was posted on June 9, 2018 at 7:59 am and is filed under Bikes, DDOT, Transportation. You can subscribe via RSS 2.0 feed to this post's comments. Good they’re reaching out. I’m on 11th and I didn’t feel we had input on the bike lane from Monroe to Spring. Other than being reminded people on bikes do not stop for stop signs, the lanes have not been a major problem and they do get a lot of use. I’m not against them but whatever happens it is good to hear they’re reaching out to the people most impacted over the issue. Agreed. I’m seeing an opportunity here to address other long-term issues as well, but that can only happen when the neighbors are part of the process. How will these lanes impact parking on Park pl? I’m not sure how good outreach is, I’ve talked to several neighbors in my block of townhouses on Park Place and no one got a flier. That said, I fully support bike lanes and any improvements that go along with them. However, when they talk dedicated lane, I hope they don’t mean putting up those ugly vertical markers. Instead of using those vertical things look like half poles I wish they would use the round dots that you see in other cities. I also wish they would paint all the bike lanes green (this should be standard), and have reminders for cars that double parking is illegal, and not what the bike lane is for. This could be a real opportunity to improve the function and aesthetics of Warder Street, though. Would have like to learn about the meeting earlier so I could attend. We live on Park Place and received a flyer but were out of town for the meeting. As a daily bike commuter, we’re hugely in favor of a protected lane on Park Place. Even more impactful is the potential to widen the sidewalks, add tree boxes, and potentially narrow southbound traffic to one lane, which could significantly reduce speeding along Park Place between Rock Creek Church and Kenyon. Over the last few years there have a been a number of bad accidents, I think largely associated with excessive speeding on Park Place. The speed camera in the triangle park is helpful, but doesn’t deter folks from regularly speeding up to 45-50 mph once they pass Princeton Place headed south, which is particularly dangerous because of the blind hill around Luray Place. Please keep us posted if there are additional community meetings or other ways to show support for the protected bike lane if we weren’t able to attend the meeting two weeks ago!